Hubby went out to UPM for the MASUM chess team tryout. The house is quiet and it would have been a perfect day to relax and sleep the whole day, except for the fact that I have to bake lots of cakes. While waiting for the brownies to be done, a lot of fresh memory from yesterday's class flying around in my head. I can still remember the conversation that I had with them, their expressions, and my emotion. I always like teaching. Have been teaching lab in UPM for a while and now I have the opportunity to conduct my own class. I want to make something different, where people can gain lots of knowledge and yet express their creativity freely. Moritz told me to write out a tentative schedule a day before the class. I was reluctant, the idea of typing out nice schedule using Microsoft Word turned me off as my body needed to rest. He told me it is for me and not for the students as it will be a useful guideline so that I can plan ahead and maximize the short time that I have. It was a great idea! I scribbled my awful handwriting on a piece of paper and plan out which cake to bake first as well as the frosting and the time duration for each. 'This could work out' as I said to myself, but then again it could work for me who has the experienced in baking but I'm not sure for others. As I was anxiously waiting for the students to come, I cooked simple lunch for me and the students (I made Maqlooba based on this recipe, but it doesn't turn out perfect and felt sorry to the students for that *sorry guys*). Buying food is always my last option as I am concerned of the hygiene and quality, and I want them to get a personal touch of the 'baker.' I made my famous 'Ultimate Belgian Chocolate Brownies' for snack so that I can give extras to the neighbors as well. Ummul and Shafa were the earliest to arrive and we started off first to avoid the delay. 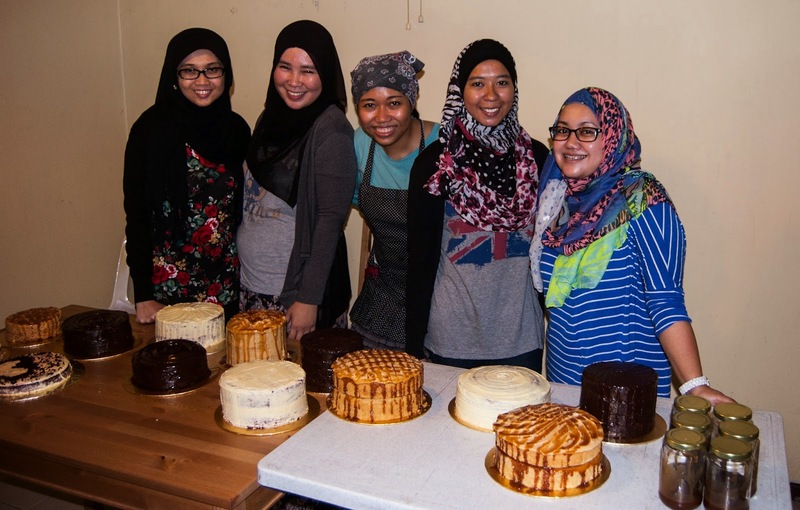 As their red velvet cake almost finished baking, Mima and Nurul joined up and I taught them how to make red velvet cake as how I taught the first group. We started making the rest of the cakes and frostings together after that. During my busy time handling the class, my husband was helping out with the dishes. I am so grateful with his kind gesture. He lightened up the burden and I am blessed with that (thanks baby <3 ). The whole day was filled with chatter and laughter. It was a relief that all of them were such easygoing and fun people. We met new people and learned a lot about each other. I love how we were able to get along so well despite knowing each other for less than a day. I taught them the easiest, and simplest way to make cakes and yet produce great results. All of the ingredients are from the finest quality, and no substitute used. We make everything from scratch without depending the store bought processed goods like Nutella and caramel sauce. Just the way I do it. I am not fancy in following long instructions with lots of steps so I always modify things to make it simpler. I do that in the lab when I'm doing experiments, and in the kitchen when I'm cooking. Some of them were surprised with my method, and yet they were so happy looking how perfect their cakes look like. Tall and fluffy, and the most important part - Delicious! As we were in middle of decorating cakes, one of them said 'no wonder the price of the homemade cakes are expensive, it is not easy to bake cake, and yet to decorate it,' and I was grinning listening to her. All bakers in the world would have hugged her if they had heard this - because it is true. I gave the freedom for them to decorate the way they like it. No rules for that as I want them to use their own creativity. Besides, this class was mainly focused on baking. It is important to know how to make delicious cakes beforehand, and decorating second. For me, tasty cake is more important than how it looks like even though some people find it vice versa. If the students like to learn how to decorate, they can join my 'Decorating Class' which will be mainly focused on decorating cakes.